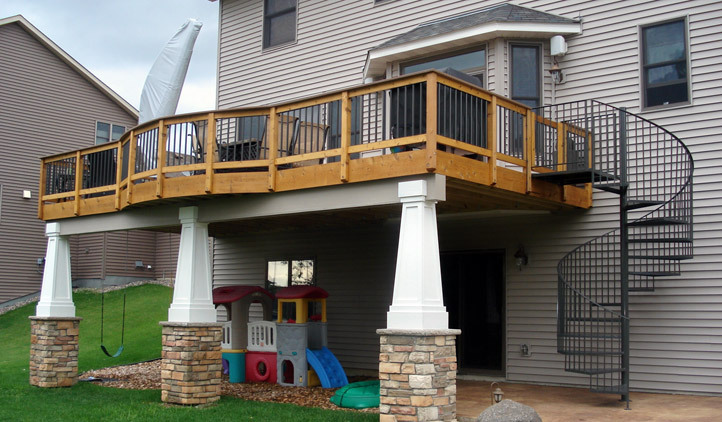 Specializing in custom cedar decks, maintenance-free decks, tropical hardwood decks, all-season porches and finished basements, John Ford Construction brings 40 years of building experience to its customers in the greater Minneapolis and St. Paul region. Family owned and operated, we offer customers the unique combination of superior construction ability with personalized attention and ongoing communication throughout the building process. We offer free estimates, and will work closely with you to design the project that fits your needs, whether starting from scratch or renovating and existing project. Visit our image gallery to see some of our past work. Contact us today to find out why our customers rave about us. References are available upon request. Call 651-308-3599 or e-mail info@johnfordconstruction.com to learn more. Variety: A range of materials to meet your needs: cedar, hybrid, or 100% maintenance-free. Flexibility: start from scratch, design an addition, convert to a new material, or remove the old and start over… we do it all! One-to-one attention: we employ no subs… you work directly with us! Peace of mind: 40 years of experience and an old-fashioned commitment to hard work and customer satisfaction.